Home Studies and Home Offices. 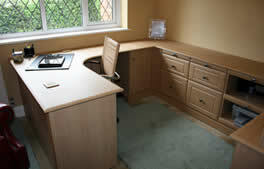 We’re experts at designing and installing home offices that enable you to work in great surroundings. We will make sure they understand how you want to use your home office, and design a bespoke solution to your requirements. 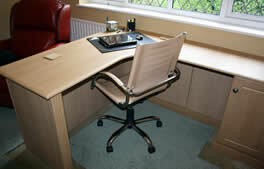 You may be a full-time home worker or require a dedicated space for when you get home from the office. Whatever your needs we will make sure that the tailored solution for your home office is a delight to work in and suits your working style. 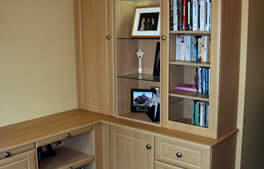 Our home office solutions are bespoke, designed and built around you. Efficiency never looked better! Copeland is an oak-wrapped finish with chamfered-edged doors. 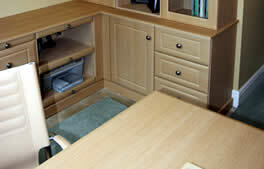 Available in matt and gloss finishes and an extensive colour range. Ravell is a chamfered-edged real wood oak veneered finish with mirror-backed display units and decorative pilasters. This is shown in a lounge area. Ravell Square is a real oak-veneered study, with good use of lighting and storage..
Bellini shown in Montana oak wrapped study utilising framed glass doors and a curved desk area. Berg shown with a simple door with slightly rounded edges in a wrapped finish, boxing in the customer's stairwell. Dorridge shown with a painted solid wood framed door with real wood-veneered worktops and extensive use of book storage..
We can help you plan your new Home Studies and Home Offices.